The Great Wall of China is one of the most visited tourist spots across the world. The magnificent relics along with the watchtowers and fortresses makes one wonder how the ancient Chinese managed to build it without any architectural knowledge or technological assistance. It is also China's national pride which has found its place in paintings, stories, legends, operas, poems and other subjects of art. The Great Wall is an example of how a country has preserved its cultural heritage over the generations. In this article, we have covered the important information that you need to know to make your visit to the Great Wall fruitful. Well, this 2300-year-old structure was built over centuries by many dynasties. It is basically a collection of walls built by different states to protect their own territorial borders. When China was unified under the Qin Dynasty between 221-207 BC, the walls of the three northern states of Qin, Yan and Zhao were united by the first emperor of China, Qin Shihuang. This was the first 'Great Wall' in its true sense extending for 5000 kilometres. We have a complete article on the building of the Great Wall. If you want to read more about it, click here. How does the Great Wall look? The real purpose of the Great Wall was to protect the territories from enemy invasion. Hence, the Great Wall is not just a wall. It is an entire defence system complete with fortresses, watchtowers, beacon towers and much more. It was reconstructed during the Ming Dynasty to make it stronger. Several new construction techniques were used to achieve the desired outcome. 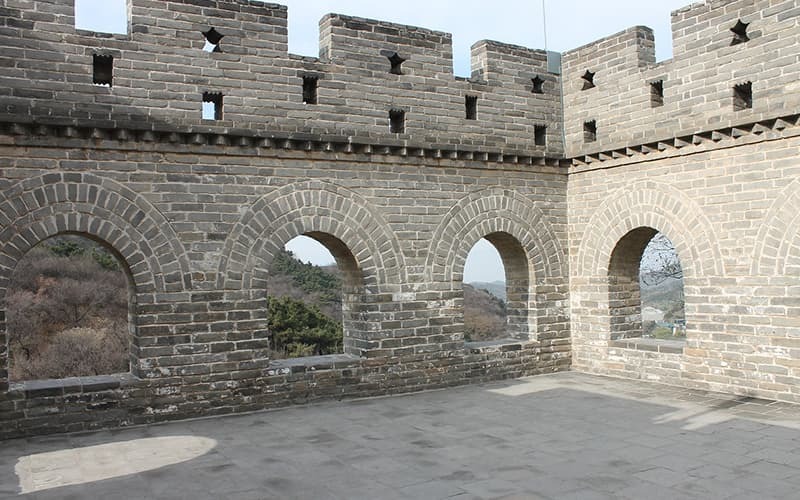 This included thick parapets at the top of the walls, towers to let defenders shoot arrows at the attackers, fortresses at junction points such as the Juyong Pass or the Shanhai Pass with archery windows and gates to make the defence stronger. These fortresses had gatehouses which are the strongest structures of the entire Wall. Picture: shoot arrows in tower. The Great Wall has been a matter of fascination not just for Chinese, but for people worldwide. Naturally, it has found a place in works of poets and artists. There are innumerable stories and legends regarding the mighty Walls too. All these artistic works are extremely fascinating and interesting to know. We have an article dedicated to all the artistic work. If you would like to read more about them, click here. 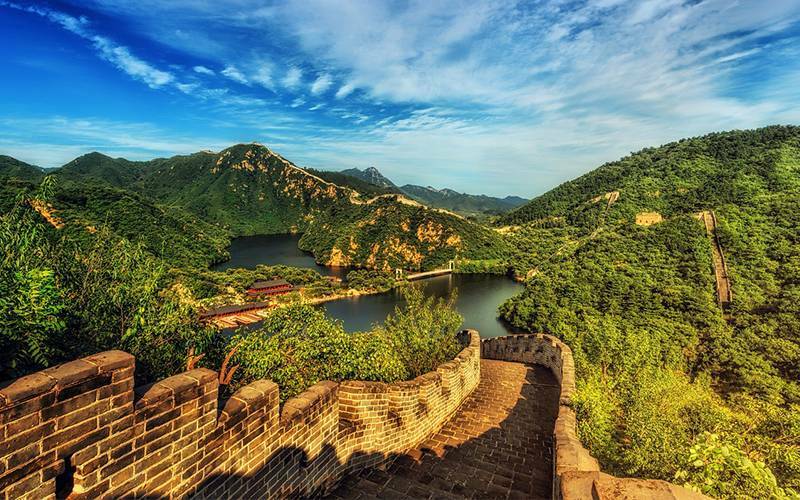 The Great Wall provides a magnificent view all the year round - be it the sunny weather of the summer or the snows of the winter. The most visited parts lie near Beijing. We strongly recommend visiting the structure during the fall season which ranges between the months of September to November. The temperatures are cooler and the valley and the mountains burst with colours - an ideal time for photography. We have a detailed article on the pros and cons of visiting the Wall in each season. If you want to read in more details, click here. As we mentioned earlier, the Great Wall is actually a collection of walls. Hence, there are several sections of the Wall that can be visited. As a tourist, you can pick and choose which portion you would like to enjoy. This section is located 70 kilometres (43 miles) northeast of Beijing. This is one of the best-preserved section and one of the most visited ones. This section is located in the mountainous area, 125 kilometres (78 miles) northeast of Beijing. This section was built by the Ming Dynasty in 1570 AD. This is the most photogenic section. It has a unique style which has never been restored since its construction. If you want to enjoy the real rustic old style wall with steep mountains and beautiful valleys on all sides, then this is the portion to visit. It is located in the Huairou District, 73 kilometres (45 miles) north of Beijing. The Great Wall is the "Great human feat in history." The Great Wall is a UNESCO World Heritage Site attracting more than 70,000 visitors per day in each section. It is the greatest building project in the world involving the blood, sweat and tears of thousands of people. To conclude, let us quote the poetic words of Chairman Mao - "Until you reach the Great Wall, you're no hero".